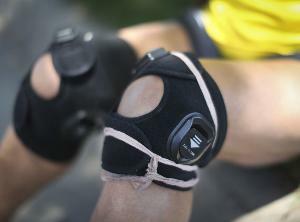 Minneapolis-based OrthoCor’s launch of a new knee brace that uses electromagnetic pulse therapy to alleviate pain and speed healing could serve as a medical technology tutorial. U.S. Food and Drug Administration approval? Check. Ample angel investment and a growing roster of impressed orthopedic doctors and happy patients? Check, check and check. But there remains a speed bump along the way to OrthoCor Medical Inc. raking in oodles of cash for its Active Knee System: Medicare and widespread insurance company reimbursement. Until that comes, OrthoCor lingers on the verge of becoming big. Without getting reimbursement, Gunderson said, even terrific new devices can disappear. Dinusson said his device is a less-costly option for people who don’t want to spend thousands on a regimen of pills, injections or more invasive treatments. But even without widespread insurance coverage, the device is selling and Dinusson said he expects to sell “millions” of his product in 2013. The device now is in about 150 clinics. In addition, OrthoCor has sold about 2,000 devices to chiropractors — and the national market is worth a potential $370 million, Dinusson said. Fourteen NFL players have used or are using it. In May, the company announced closing on $2.4 million in angel investment, bringing OrthoCor’s financing to about $5 million since it launched in 2007. The focus now is selling the brace, which uses a pair of disposable “pods” to deliver heat and activate the electromagnetic therapy, nationwide. OrthoCor recently hired a national sales director to expand its reach. And OrthoCor is expanding its product line, including over-the-counter heat-only and cold-only devices, as well as developing braces that use electromagnetic pulse therapy to treat pain in the neck, ankle, lower back and elbow. “The thing works,” Dinusson said. Still, he became an investor and now serves as OrthoCor’s medical adviser. John Cretzmeyer also is convinced. An avid runner who has about 67,000 miles and 62 marathons in his lifetime, Cretzmeyer has also suffered degenerative damage to his knees. His right knee has been replaced; the left will have to be replaced soon. The device’s combination of pulse therapy and heat helps him stay active, he said. He bought one for each knee. “I have used it. It has helped my recovery from all the various surgeries,” he said, adding that he is on the tennis court four days a week and works with a personal trainer three days a week.